(Phys.org)—Astronomers using data from NASA's Wide-field Infrared Survey Explorer, or WISE, have discovered dust in an unusual place—just outside the reach of a binary star system with a short 3-hour orbit. The binary consists of a white dwarf with a red dwarf companion separated by a distance slightly larger than the radius of the Sun; an extremely small stellar orbit by astronomical standards. The system is known as a "post-common envelope" binary because at some point in the past, one of the stars had expanded so much that its envelope of material engulfed the other star. This short-lived (months to years) phase is known as a "common envelope". 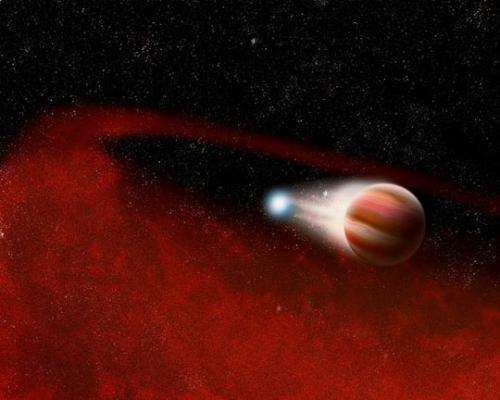 It's believed that the binary originally consisted of a star like the Sun and a red dwarf. When the Sun-like star reached the end of its life, it swelled into a huge red giant, eventually encompassing the companion red dwarf in material from its outer atmosphere. During this process the red dwarf companion spiraled in closer to the giant's dense stellar core. This inward spiral pumped energy into the giant's envelope and hastened its demise by ejecting its outer layers of gas. The stellar core and the red dwarf survived this cataclysm as a very close binary, with the core slowly cooling into a white dwarf. The binary, known as SDSS J0303+0054, was first discovered through the Sloan Digital Sky Survey, and observed with WISE as part of a large survey of thousands of white dwarfs in infrared light. White dwarfs are typically hotter than the Sun, but are only about the size of Earth, so they emit as little as 1/10,000th of the amount of infrared light emitted by the Sun. This makes it possible to search nearby white dwarfs for the light from surrounding dust and brown dwarfs that would typically be drowned out and undetectable around larger and brighter stars. Astronomers find such interesting objects by looking for excess light in the infrared with WISE that cannot be explained by the white dwarf alone. Another object must be shining brighter than the white dwarf at those wavelengths. In the case of SDSS 0303+0054, the amount of light observed in the infrared was more than what could be explained by the white dwarf and its red dwarf companion combined. The survey was conducted to look for dust and brown dwarfs around single white dwarfs, so it was particularly surprising to see the strong signal of light from dust around a white dwarf binary like SDSS J0303+0054. This is the first example of such a system. Based on the brightness of the binary in the infrared, WISE astronomers calculated the rough size of the disk to extend from a distance equivalent to two times the Sun's radius out to just beyond the orbit of Venus in our Solar System. Astronomers also estimated that the amount of dust was equivalent to the mass of an asteroid a few tens of kilometers in radius, slightly smaller than the size of Los Angeles. The origin of this dust disk is particularly mysterious, because planets, asteroids, and comets are not expected to survive at such distances during the evolution of the larger star during its red giant phase. Its radius would have extended well beyond the orbit of Earth in our own Solar System and anything closer would have been quickly destroyed and turned into gas. That leaves two possible explanations for the dust. One possibility is that it is caused by multiple asteroids that orbit further away and somehow are perturbed close to the binary and collide with each other. The other is that the red dwarf companion releases a large amount of gas in a stellar wind that is trapped by the gravitational pull of its more massive white dwarf companion. The gas then condenses and forms the dust disk that is observed. Either way, this new discovery provides an interesting laboratory for the study of binary star evolution. Super cold brown dwarf or is it a planet?